Warmer weather is on its way and now is the perfect time to start cleaning up, clearing out and revamping your space for Spring. Most of us are cleaning out our closets to change our wardrobes for each season, so why not do the same for our homes? If your space is feeling slightly lackluster, Sheely’s is here to help! Here are a few simple ways to add some personality and liven up that living room. After the holidays, living rooms tend to feel a little empty. The easiest solution is to spruce up your space with a little bling! Try adding a few new accessories to your cocktail table, end table or bookshelf. Let your personality shine through. Accessories are also a great and inexpensive way to add pops of color and mix in some metals too! A trend that is growing in popularity as of late is to choose dark colors for your window trim, and it looks AMAZING! You can go slightly darker or even black to give your room more depth and to nicely frame your view to the outdoors. To allow this detail to shine, be sure to run the curtain track beyond the edge of the window. This will enable the curtains to be drawn back completely, revealing your fabulously contrasting window frames! Your home is your gallery. Make your living room your masterpiece by changing up or adding artwork that expresses your personality and style. Don’t be afraid to get a little quirky! This only adds character. 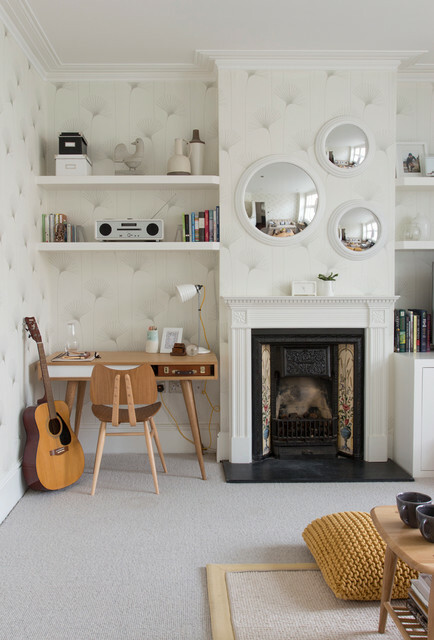 Go for mirrors with different shapes & sizes and hang an eclectic mix of framed photos or art prints. Creating a gallery wall is also a great way to revamp – learn how here: Hanging with Sheely’s. Coffee tables, end tables, sofa tables and cabinets are a great way to add style and function to your living room. It’s also a great way to add a little flare by choosing tables that have rustic, industrial, metal or modern features. Whatever your style, Sheely’s has something for everyone. We love the rustic and industrial look of the Parsons Collection from Hammery, pictured above. Don’t forget to add accessories that will take your accent tables from a catch-all to eye-catching! Check out our guide here: Coffee Table Buzz. Area rugs are a great way to add personality and comfort to your living room. There really is no right or wrong when it comes to rugs, it all comes down to preference. You can choose a rug that sits within the furniture, one that runs halfway under the furniture or a rug that is large enough to extend beyond all of the furniture including side tables. Try layering rugs – an unexpected way to switch up your decor by mixing patterns, prints, and colors. There are no rules when it comes to this trend, so go ahead and have some fun! For more tips and ideas visit our YouTube Channel or check out our website at Sheelys.com! This entry was posted in Decoration, Design Tips, Home, Home Decor, interior design and tagged home decor, Home Updates, Living Room, Spring, Updates by sheelysfurniture. Bookmark the permalink.